The Big Issue Group is made up of The Big Issue Company and Big Issue Invest, and the Big Issue Foundation, a related charity that supports Vendors of the Big Issue magazine. 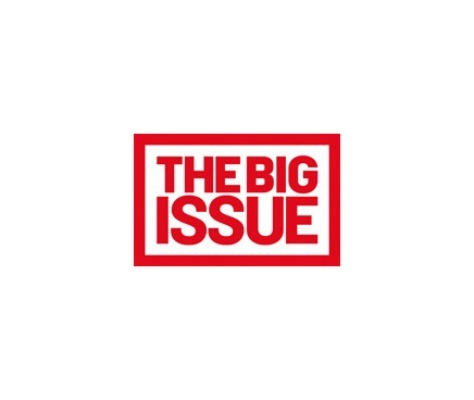 The Big Issue Company and Foundation primarily exist to support homeless and vulnerably housed people by providing a meaningful and legitimate income selling the Big Issue magazine. The Big Issue welcomes people who are homeless and to become Vendors of the Big Issue Magazine. Big Issue Vendors buy the Magazine for £1.25 and sell it on to customers for £2.50, keeping £1.25 for every magazine they sell. The Big Issue Foundation complements the work of the Big Issue Magazine. The Foundation works on a “Service Brokerage” model, connecting Vendors with the support and solutions that will help them continue to rebuild their lives. Support staff at the Foundation work in partnerships with other agencies to ensure Vendors are accessing all the support that is available and that services are working in a holistic manner. While the Magazine offers “a hand up” to people in the depths of homelessness crises, Big Issue Invest supports the scale-up of social businesses, charities and ventures that respond to social needs and help prevent people from reaching crisis point in the first place. Big Issue Invest is a “social investment financial intermediary”; part of a growing movement of organisations that harness the power of financial investment to grow social enterprises that are responding to urgent social needs. Big Issue Invest raises money privately (not from the sale of the Magazine) and invests in organisations that are delivering vital community services to enable them to grow and achieve sustainability. Homelessness often comes wrapped up with other problems and many people who are homeless are also deeply socially and financially excluded. Substance misuse, a history of personal trauma, and mental health problems are common. The Big Issue exists to offer people in this situation a first step on the path out of poverty. On an average week in 2014/15 there were 1,490 Vendors selling the Big Issue Magazine across the UK, each selling an average of 43 Magazines. That’s £54 earned per Vendor per week. Earning a legitimate income is the first step on that journey. The work of the Big Issue Foundation supports the next step. Last year the Big Issue Foundation with over 2,200 individuals to support them to achieve their goals. The road out of homelessness can be a long and difficult one. The Big Issue Foundation offers support to Vendors for as long as they need it. 17% of the Vendors that the Foundation supported in 2014/15 had been with the Big Issue for over four years. While the Magazine and Foundation work directly with Vendors to help them move forward, Big Issue Invest supports other charities and social enterprises to do the same. Big Issue Invest has invested over £30 million in social ventures and advised on the investment of a further £85 million invested in the Threadneedle UK Social Bond Fund to ensure those funds are reaching businesses that have a positive social impact. 1910 Vendors were supported to achieve their personal sales goals. Sales goals aren’t just about meeting “targets”; they are about Vendors reaching milestones in their journey towards employability. They include completing sales training, winning Vendor of the Week or Month, or becoming a “Vendor Co-ordinator”, a position of responsibility within the Big Issue team. 153 Vendors were supported to achieve personal aspirations. These are the goals Vendors set in their personal lives. That could mean anything from re-connecting with family to taking up a hobby. 114 Vendors were supported to achieve employment and volunteering outcomes, from the first steps of writing a CV to making the leap to a new job. 112 Vendors were supported to access vital healthcare services. People who are homeless have much higher rates of physical and mental health problems than the general population but they often struggle to access appropriate healthcare services. The launch of the “Social Enterprise Investment Fund II”. The Fund has already raised £9m and invested in innovative projects such as the “Mental Health and Employment Partnerships” 5-year social investment bond, which provides intensive support to enable people who have been long-term unemployed and have mental health problems to get back in to work. The continued growth of the Threadneedle UK Social Bond Fund. This Fund, under the advice of Big Issue Invest, provides ordinary individuals to invest their savings in socially beneficial businesses, bringing social investment to the mainstream market. Completion of the second Corporate Social Venturing programme, which has invested £891,000 in 26 nascent social businesses helping them to get off the ground.